Take 1 capsule a day after the main meal or differently after consulting a doctor. The weakening of the immune system is a quite common phenomenon, especially in autumn and winter. Low temperatures and weather changes are not conducive to well-being and do not favor a good health condition. In addition to the ingredients contained in the preparation, it is also worth remembering of regular vitamin D supplementation, which can further strengthen the body and protect us against colds or flu. Allicin – a substance found in Garlic that is responsible for the antibacterial, antiviral and antifungal properties may also be useful. Patented B. longum BB536® probiotic bacterial strain. It supports intestinal health, strengthens immunity. Highly standardized plant extract, has strong anti-inflammatory and analgesic effect. Bromelain is a proteolytic enzyme derived from the pineapple plant that has protein-digesting properties. 4-strain probiotic in the form of gastro-resistant capsules. 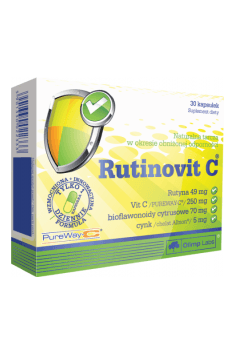 Support for the liver function, immunity. Zinc amino acid chelate - an organic compound formed by complexometry i.e. the coupling of a metal ion (zinc) and amino acid. As a result of zinc chelating, a substance, with greater opportunities to use by the body, is obtained, thanks to an increase of bioavailability of the body. Maintains acid-base balance (pH factor ensuring stability in the body). It is used in medicine to treat poisoning by heavy metals (antitoxin). Its neutrality with respect to compounds hindering the bioavailability of zinc (e.g. Phytates) reduces their performance and improves bioavailability of the metal. It is very important that zinc is involved in many metabolic and energy processes. Participates in the synthesis of proteins, the production of certain hormones (especially testosterone) and increases immunity. Supplements containing zinc amino acid chelate are recommended in sport because of the perfect synthesis of testosterone, especially for athletes practising sports that require endurance and strength training. It should be included in the diet of vegetarians and vegans. Zinc amino acid chelate is available in the form of mono preparations (often fortified with ascorbic acid - vitamin C), vitamin and mineral supplements, also as a component of complexes such as ZMA, MZB. Dosage: 10-30 mg per day.